If you read my post earlier this week, you already know how much I adore these two. They are lovely together, but what I really appreciate is how important it is for them to reflect Christ in their relationship. Being part of a wedding that begins on such a solid foundation makes the day so much more meaningful for me. Keep reading to hear more about Andrew and Rachel's story. How did the two of you meet? Andrew and I met on August 3, 2013. I was taking a road trip across the United States and Cincinnati was my first stop of the journey. A mutual friend connected the two of us so that Andrew could show me around the city. We spent about four hours together that day and then I continued on down to Louisville where I would be staying with a friend for a few days. As I was driving away I remember thinking how bummed I was that I wouldn't get to see Andrew again (or so I thought!) but I didn't even think he had any interest in me whatsoever! A little after I got to Louisville, Andrew texted me to make sure that I had gotten there safely. We texted back and forth for about a week and then exactly one week after I met him (while I was in Colorado), he called me. I pulled over to the side of the road as he explained that he wanted to pursue me, but that he knew it would look a little different since I was traveling. I wasn't sure, so we took a few days to pray about it and God changed my heart from laughing about the situation to knowing that I was supposed to follow Andrew's lead. So, for the next four months, as I traveled through 27 different states and four different countries, we spent time video chatting, texting, and talking on the phone with a few, brief, in-person visits mixed in. 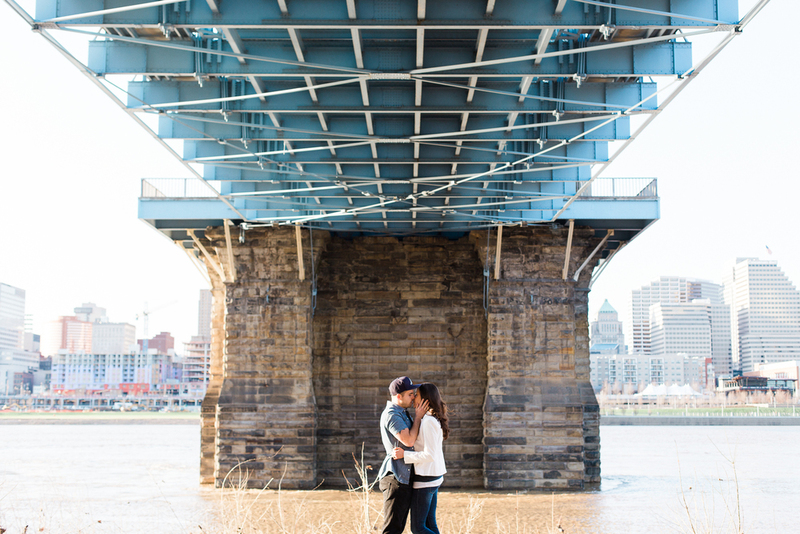 In January of 2014 I moved to Cincinnati and in January of 2015 he proposed. Tell me about the proposal! The day that Andrew proposed, he sort of recreated the first day we met by taking me to some of the places we visited when he was my tour guide. We ended on the Purple People bridge, where we had had our first picture together taken. He shared his heart with me and then proposed, all while having a friend take pictures. After the proposal he drove me to a friend's house where several of our close friends from church were waiting to celebrate with us. The ring was ready a week early, so everyone literally put together all of the details for the proposal in less than 8 hours. It was insane. We both felt SO loved by everyone's support! What are you most looking forward to on your wedding day? I think we are both most looking forward to the Gospel being presented and God being glorified as we make a covenant before Him and so many of our family and friends. Rachel and Andrew, I am beyond thrilled to be joining in your wedding celebration this weekend. Praying for beautiful weather, lots of joy, and endless love!